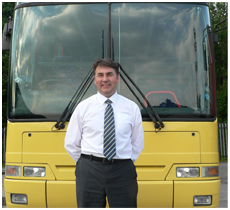 We would like to welcome you on board and introduce you to Paul Orrell Coach Hire. Having qualified through Oxford Cambridge and RSA examinations, obtaining a level three certificate of Professional Competence in National Passenger Transport In July 2012, we were granted the authority to operate our coach hire service. We are totally committed to providing you with a reliable, safe and price competitive solution to your coach hire requirements. In 2012 we acquired our first vehicle, a Volvo Plaxton Premiere 350 which we upgraded in 2016 to a Setra Mercedes driven 415HD, top class, regarded by many in the industry as the most comfortable passenger vehicle on the road. Reclining seats with seatbelts, drop down tables and footrests. Our main priority is your safety. Our coach is well maintained in accordance with The Driver and Vehicle Standards Agency requirements and subject to a 6 weekly pre-planned maintenance programme ensuring you and I can be confident of maximum reliability and safety at all times. Our operating base is just minutes away from Junction 31 of the M6 in the North West, with easy access to the motorway, equidistant from Blackburn and Preston therefore ideally situated for a rapid response in cases of emergency airport or railway replacement service. If you are looking for a reliable coach hire company to transport a group of pupils on a school trip or excursion, our comfortable and clean coach will make everything easy for you. Paul Orrell Coach Hire provides a friendly and reliable coach hire service for all occasions - from school trips to wedding parties, we cater to any group. Our comfortable and clean coach will provide you with a satisfying way to travel. Let our experienced coach drivers transport your party to your location or event, enabling you to relax and enjoy your journey.